The Waste Management Phoenix Open this week will mark Johnny Miller's final event as NBC’s lead golf analyst. 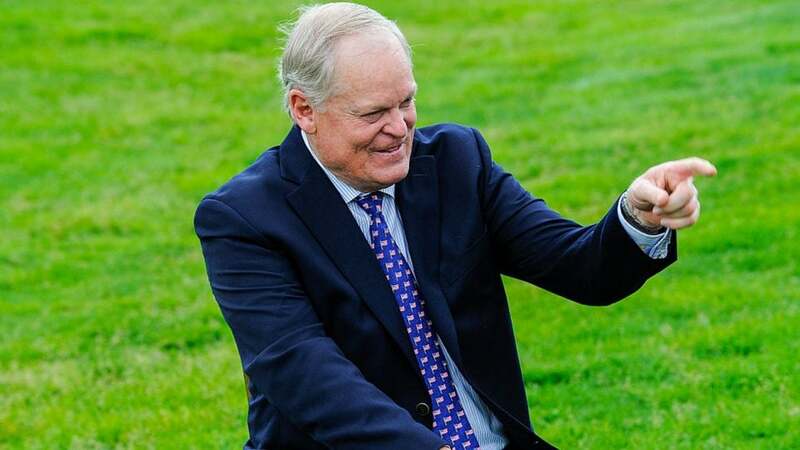 In the span of his long career as a golf pro-turned-golf broadcaster, Johnny Miller earned renown for two special skills: firing iron shots at flagsticks and launching zingers from the tower. As evidence of the former, check out the YouTube highlights of Miller’s final round 63 in the 1973 U.S. Open at Oakmont. And as proof of the latter, well, keep reading. Miller, 71, is getting ready to retire; this week’s Waste Management Phoenix Open will mark his final event as NBC’s lead analyst. As the famously frank two-time major winner (and multiple-time Emmy Award nominee) prepares to ride his golf cart into the sunset, we compiled a list of his 14 most memorable on-air remarks. 1. “If Ben Hogan saw that, he’d puke.” That image of the Wee Ice Mon upchucking came in the waning hours of the 2004 Ford Championship at Doral as Craig Parry, the Popeye-forearmed Aussie with the unconventional action, made his way toward a playoff against Scott Verplank. Miller’s mic-drop comment brought chuckles from Dan Hicks, Johnny’s longtime broadcast partner. But it was Parry who enjoyed the last laugh by jarring his approach for a walk-off eagle on the first playoff hole. https://www.youtube.com/watch?v=aQkz9WuXNbE 2. “If he couldn’t chip, he’d be selling cars in San Diego.” Not that there’s anything wrong with that. Nevertheless, Phil Mickelson was reportedly displeased with Miller’s characterization of his play at the 2010 Ryder Cup. 3. “There a reason Mr. Clark has finished second eight times.” The Mr. Clark in question was Tim Clark, who was on his way to winning the 2010 Players Championship but still hadn’t managed to win Miller over. So deep were Johnny’s doubts that when Clark found the fairway on the 18th hole at TPC Sawgrass, Miller said he found it “unbelievable.” Some players found his comments just as hard to fathom. 4. This is “probably on paper the worst Ryder Cup team we’ve ever fielded.” Harsh, right? But given the 18.5-9.5 shellacking Team USA endured at the K Club in 2006, do you really want to argue that Miller got it wrong? 5. “My hunch is that Justin needs to go home and watch it on television.” There’s no doubt Justin Leonard wasn’t on his A-game. But many still believed that Johnny was being an a-hole with this comment at the 1999 Ryder Cup in Brookline. Miller later expressed his regrets, saying he’d like to have a mulligan on the remark. 6. “Well, if you’re going to lose a finger, the right index finger is the one to lose.” Even the best broadcasters don’t always have the best bedside manners. Witness Miller’s cavalier assessment of the injury sustained by Jesper Parnevik, who nearly lost a digit in a motorboat accident prior to the 2012 Shell Houston Open. “That finger doesn’t serve in the golf swing anyway,” Johnny said, “and you could always change your grip if you lose that finger. So Jesper, you’re going to be okay.” 7. “He goes to the Masters and really fell apart from pressure. The first time in his career that I can say Tiger gagged a little bit because he wanted it so bad.” By 2012, Tiger Woods had been revealed as a man, not a machine. But a choker? That was a term reserved for lesser mortals, until Johnny applied it to the four-time Masters champ. 8. “He looks more like the guy who cleans Tiger’s swimming pool.” When he said it, you could tell that Miller meant it as a compliment and a nod to Rocco Mediate’s everyman bearing as he battled Tiger Woods in a Monday playoff at the 2008 U.S. Open. But taken out of context, it was taken as a put-down, for which Johnny later apologized. 9. “If everyone on Tour played like him, I’d quit announcing.” This zippy quip from the quick-thinking Miller came at the 2014 Valero Texas Open, in response to Andrew Loupe’s agonizingly slow pace. 10. “That Tiger drop was really, really borderline. I can’t live with myself without saying that.” Barely a month after a controversial ruling at the 2013 Masters, Woods came under scrutiny again. This time it was on the 14th hole at TPC Sawgrass during the final round of the Players Championship. Tiger took a drop that took Johnny aback. Nor did Miller take his words back afterwards. 11. That was the “first time in history someone’s shot 62 and never smiled.” So said Johnny of Jim Furyk’s sizzling (but stoic) round at the 2008 BMW Championship. Maybe Furyk didn’t smile. But the rest of us cracked up. 12. “He’s just taking way too much time. He’s being fairly dramatic here.” With the winds at gale force at Kapalua during the 2013 Hyundai Tournament of Champions, Miller set off a tempest in the Twittersphere with his assessment of Ian Poulter as the Englishman dallied over a putt. “Johnny Miller,” Poulter tweeted post-round, “why don’t you come interview me live and say that stuff straight to my face.” https://www.youtube.com/watch?v=-LfY5MHEOUg 13. “A win is a win, but you’ve got to learn to finish out Sundays like a true champion. He hasn’t learned how to do that yet.” And judging from his comments about Rickie Fowler at the 2017 Honda Classic, Miller hadn’t learned to pull his punches. Most of us were very glad for that. 14. “I think he overdid the weight room, personally. I don’t think that helped him at all. I think the same thing with Tiger Woods. You just get carried away with wearing the tight shirts and showing off their sort of muscles.” It wasn’t Project Runway. It was the 2017 British Open. And it was Johnny’s way of saying that Rory McIlroy’s game was nowhere near as toned as his beefcake physique.